What is a Billiken, Anyway? This Year’s Most Overlooked Contender and Its Unique Mascot. 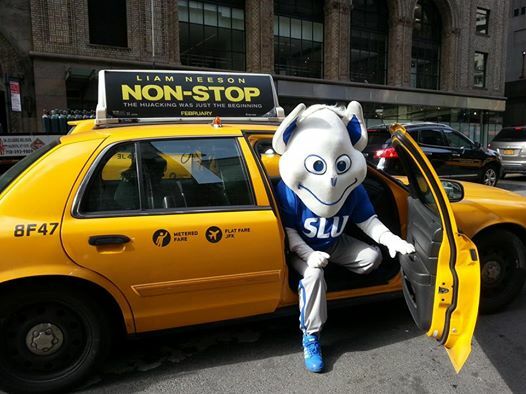 Why wouldn’t Saint Louis University belong with the elite basketball programs in the country? Is it because it doesn’t have a rich and successful basketball history? In 1948 they were arguably the best team in the country and won the NIT back when it was more prestigious than the NCAA Tournament. Is it because they don’t send players to the NBA? What about “Easy” Ed Macauley who won an NBA Championship in 1958 and was inducted into the Basketball Hall of Fame in 1960 or Larry Hughes who was the eighth overall pick in the NBA draft in 1998? Or is it because in “modern” history Saint Louis has failed to maintain a consistently winning basketball program? Perhaps that’s fair, but what if they’re in the process of changing that? Or do they not belong for other reasons? Maybe it has something to do with the fact that recruiting pitches are much more likely to involve the letters B.A. than they are to include the letters NBA. Or maybe it’s the enforced academic standards and lack of special treatment to athletes. In four years at Saint Louis University, I took three classes with members of the basketball team. Just like me, our star player had to say “Puedo ir el bano?” to go to the bathroom in Spanish 110. Could it have to do with a moral standing that every player is held to, coinciding with the University’s Jesuit mission statement? In 2010 the roster was decimated when a sexual assault case was brought up against a number of core players. The charges were dropped in court for all the players, but months later, just before the season started, all the players involved were suspended one semester because the incident violated the school’s conduct code. Two of the players transferred rather than serving the suspension. Another, Willie Reed, declared for the NBA and was eventually signed by the Memphis Grizzlies. Maybe it would make sense if these things were why Saint Louis doesn’t belong with elite basketball programs. There’s a way of running big time college sports programs and Saint Louis University just doesn’t fit in. …And why would the legendarily successful and respected coach Rick Majerus want to coach a Billiken? Well, there was actually a practical reason for that. Majerus’ mother was ill and being treated in Wisconsin when he was hired as head coach of Saint Louis in 2007. The job allowed him to be closer to his mother in what were likely the last years of her life. He had recently turned down the head-coaching job at USC. A paragraph could never sum up what you need to know about Majerus, but I can give you the bullet points. There were three things that just about everybody seemed to know about him: he loved basketball, he said what he wanted to say whenever he wanted to say it, and he ate whatever he wanted to eat….whenever he wanted to eat it. Majerus was candidly funny about his own weight issues, but some found his opinions on other subjects less humorous. In his first season at Saint Louis, he made comments regarding Hilary Clinton that suggested he supported women’s right to abortion. The archbishop of the city of Saint Louis stated publicly that he expected SLU, a catholic institution, to take proper disciplinary action. On the basketball court, Majerus immediately implemented his ‘slow the game down’ offense with his inherited team. He coached a style of play that was meant to frustrate other teams and, more importantly, allowed his perhaps less talented team to maintain a close score until the end of the game. In other words, it gave his squad a fighting chance. In January of his first season (about five weeks after I had decided to attend SLU), Majerus slowed the game down a little bit too much against George Washington. The Billikens only scored 20 points the entire game as a team, setting an NCAA record for least points scored in a game. The Billikens finished 16-15 and 7-9 in the Atlantic 10 conference that first season. Over the next five years, Majerus refused to stop saying whatever popped in his head (whether brass, hilarious or self-depreciating) and he refused to stop coaching his style of play. A funny thing happened along the way. It was almost like he had a plan all along. Almost like the guy who won over 500 games without coaching a traditional powerhouse program, and who had taken the University of Utah to the National Championship, just maybe knew what he was doing. His words eventually won over the St. Louis community and his style of play eventually won him a lot of basketball games. All the while, he spent his off-seasons barreling into living rooms in Chicago, Wisconsin, Texas, Australia and New Zealand to talk about food and convince mothers that Saint Louis was the place for their baby boys. Never have I been asked that question more than during the opening round of the 2012 NCAA Tournament, my senior year at Saint Louis University. The Billikens were back in the ‘Big Dance’ for the first time since 2000. My buddy, Donnie, and I decided to forgo Spring Break shenanigans in the Gulf Shores to drive to Columbus, Ohio and support our team. Camaraderie sparked by a love of basketball and tradition. “This must be what it feels like to be apart of a good basketball program,” we thought. It felt like we were somewhere we belonged. That feeling didn’t last long when we arrived outside the arena where eight NCAA basketball teams would play over the next two days. There weren’t nearly as many blue Saint Louis University shirts as there were NC State, Memphis or Michigan State polo’s and windbreakers. Preceded with a smirk and followed by a chuckle, people kept asking that question (with the “anyway”). “A Billiken is what’s about to beat your team in the NCAA Tournament,” Donnie replied to one particularly obnoxious Spartan fan. Embarrassed, I immediately put my face in my palm. I didn’t leave him hanging, but it was still such a corny comeback. The Billikens won their first NCAA Tournament game in 14 years that day beating Memphis 61-54 and sending a lot of overconfident Tiger fans back to Tennessee early. Saint Louis followed that up by pushing a number one seeded Michigan State to the brink of elimination before losing by just four points. Donnie and I left the arena with our heads held high. No one asked us that question on our way out. That was the last basketball game that Rick Majerus ever coached. In the press conference he broke character and shed a few tears claiming he would miss the players in the future. It was like he knew. He died eight months later of heart complications. He outlived his mother by one year. Well, they’re Jim Crews’ team to worry about now. When Majerus was going through medical issues in the fall of 2012 Crews took over on an interim basis. When Majerus passed away on December 2nd, 2012, shaking the Saint Louis community, the “interim” label was essentially dropped. Convinced by Majerus to come out of retirement and be his lead assistant coach a year earlier, Crews was now leading the ship of a team with unfamiliarly high expectations. But there was no question who the team was truly playing for. The players rallied for their late coach. They won nine straight games after his passing. They played themselves into a top 25 ranking and never looked back, winning their conference for the first time since 1971. The Billikens went into the tournament as a fourth seed, their highest seeding ever. With a veteran roster, they were prepared to honor Majerus by focusing on his two key fundamentals: defense and rebounding. After handily beating New Mexico State in the first round, they had their first poor performance in months against Oregon and suffered a disappointing loss, unable to advance further than they had the previous season. They’re back in the top 25 this year, finishing the regular season ranked number 18 in the nation with a 26-6 record. They have what is considered by many prognosticators to be one of best defenses in the country. They strung together a 19-game winning streak from December to March, the longest in school history, which at one point earned them the number 10 ranking in the country. In 2012, Majerus predicted he would make Saint Louis a top-10 team in three years. It only took two. And it happened on what would have been his 66th birthday. They start a lineup of five seniors. A senior class that was recruited by Majerus. A senior class that committed to Saint Louis at a time when most causal sports fans didn’t realize the school had a basketball team. When key players were suspended in 2010, it was this class (then freshman) who were thrown into the fire before they were ready to carry a team. Four years later they will graduate with more wins than any class in school history. Dwayne Evans leads them at power forward, quietly getting double-doubles by using his 6’6 body to overpower smaller forwards and blow by slower forwards. Jett provides most of the team’s flash, but that’s not what the Billikens are about. They are all business. They are still about defense and rebounding and frustrating their opponent (and their opponents’ fans). Losing last season was painful for the SLU community because it was all in Majerus’ honor. The Billikens’ success last year was supposed to be their gift to his memory. But perhaps the fact that the Billikens are right back in the spotlight is the real gift. At times this season SLU has been ranked higher than North Carolina, Michigan State, UCLA, Louisville, and Kentucky. In other words, the elitist of the elite. They have reached the NCAA Tournament for the third straight year, this season as a fifth seed, waiting to play the winner of Xavier and North Carolina State. Rick Majerus didn’t put together a good team. He built a program. Well, originally a Billiken was a good luck charm created in Kansas City, Missouri in 1908. Giving someone a Billiken was like wishing them good fortune. They became extremely popular, sort of like the Beanie Babies of their era. Eventually Japanese culture became enamored with the Billiken and they could be found all over the country. Saint Louis University still had a football team at the start of the 20th century and their head coach, John R. Bender, was said to resemble the little creature. Reporters started jokingly referring to the team as the “Billikens” and it stuck. Eventually the university officially adopted it. ….You know what? Disregard that. A Billiken is what’s about to beat your team in the NCAA Tournament. I’ve worked at SLU for 14 years and this is the first time I’ve completely understood the basketball legacy. Thank you – I’m sorry I didn’t get to know you when you were a student.